The most successful collection sites all have one thing in common... they all make a point of promoting themselves. 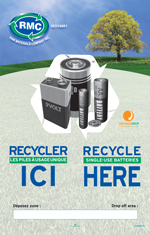 It can be as simple as placing your battery recycling container in a high traffic area or at the point of sale. 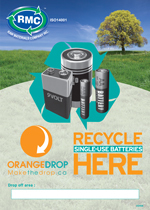 Consider placing a poster on the door to let people know that they can Recycle Batteries Here! Some retail collectors make a point of telling every customer buying new batteries that they can recycle their used batteries the next time they come in. Whatever you choose to do, we are here to help! We have a variety of promotional materials that are guaranteed to get noticed! We understand that some retail chains may have strict branding guidelines, RMC can assist you with your own branded program. If you are interested in using our promotional materials, get in touch with an RMC representative today!